A flower tribute is seen outside Al Noor mosque where more than 40 people were killed by a suspected white supremacist during Friday prayers on March 15, in Christchurch, New Zealand, March 27, 2019. On a small farm on the outskirts of Christchurch in New Zealand, Omar Nabi digs a small hole and sharpens a knife as he prepares to slaughter a sheep as a blessing to his father -- a victim of the mass killings at the Al Noor mosque. Omar Nabi, 43, originally from Afghanistan, takes a moment to recompose himself as he speaks about his late father, Haji-Daoud Nabi's love for cars at Haji-Daoud's property in Christchurch, New Zealand, March 31, 2019. Zahra Fathy, widow of 70-year-old Hussein Moustafa, an Egyptian immigrant who lost his life in the Christchurch shootings, embraces a neighbor in Christchurch, New Zealand, March 30, 2019. ​"Being all on your own during Ramadan is tough," said her son, Mohammed, who flew home from a new job in Saudi Arabia on learning of his father's death. 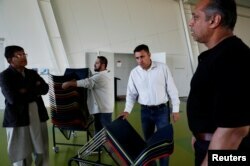 Sardar Faisal (2nd L) from Pakistan, a survivor of Christchurch shootings, helps to arrange chairs for a special prayers for the victims of the attacks in Christchurch, New Zealand, March 31, 2019.